Recently we have heard, seen and read an overwhelming amount of many news that portray the Arab world in a negative way. We feel, all too often, these perceptions are based on typical stereotypes and fear of the unknown. Misinformation of this sort can truly be harmful, contributing to a continuation of intolerance, racism and less inclusive societies. As part of NA3AM‘s mission to inspire and empower the Arab world we’d like to begin a new line of content focused on the positive impact Arabic thinkers have had on today’s world. We hope to start a positive trend of information and conversation around the Arab world, our culture and heritage. We believe education and information are the only way forward. By facilitating access to the work carried out by Arabic thinkers that have helped shaped today’s world, we hope to shift the negative impact terrorism and separatist media have on the image of the Arab world. Not all Arabic people are Muslim, and definitely not all Muslim people are terrorists. We’d like to begin this positive line of content sharing with you a top ten list of Middle Eastern writers whose work have had a positive impact on society. These are top influencers whose work have helped shape the modern world and still manage to inspire us daily. Born on 15 July 1926; Driss is one of the most famous pioneers of Moroccan francophone Literature. Driss’ novels deal with colonialism, culture clashes, generational conflict and the treatment of women. Born on the 29th of May 1933; in Amman, Jordan. Abdel was son of a Saudi father and an Iraqi mother. His father was a merchant from the “Alaqilat” tribe, famous for their trade business between Qassim and the Levant. He was considered an expert in the oil industry and as such was appointed the head of Oil and Development magazine. He devoted his life to writing novels and is one of the most important Arab novelists of the twentieth century. Abdel Rahman was able to reflect the social and political reality of the Arab heritage and cultural shifts witnessed by Arab societies, especially in the Arab Gulf states, also known as the “oil countries”. The novel “Cities of Salt” is the most important of his novels that tells of the discovery of oil in Saudi Arabia. It is composed of five publications, all of them a must read! Hosseini is an afghan-born American novelist and physician that achieved worldwide recognition with his first novel “The Kite Runner”. In addition to his thriving literary career, Dr. Hosseini now serves as a special envoy for the United Nations High Commissioner for refugees, assisting displaced people in war zones around the world. “The Kite Runner” became an international publishing phenomenon and a modern classic. The film, following the book, also received multiple awards, including a nomination in the Golden Globe Awards for the “Best Foreign Language Film”. Following the enormous success of his first book, his second novel, “A Thousand Splendid Suns”, soon made it to the bestseller lists. Dr. Khaled Hosseini also provides humanitarian assistance in Afghanistan through the Khaled Hosseini Foundation. Considered Palestine’s most eminent poet, Darwish published his first collection of poems in 1964, “Leaves of Olives”, when he was 22. Since then, Darwish has published approximately thirty poetry and prose collections, which have been translated into more than twenty-two languages. In his work, Palestine became a metaphor for the loss of Eden, birth and resurrection, and the anguish of dispossession and exile. He has been described as incarnating and reflecting the tradition of the political poet in Islam, the man of action whose action is poetry. 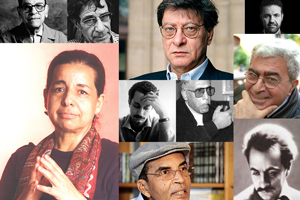 Darwish’s awards and honors include the Ibn Sina Prize, the Lenin Peace Prize, the 1969 Lotus prize from the Union of Afro-Asian Writers, France’s Knight of Arts and Belles Lettres medal in 1997, the 2001 Prize for Cultural Freedom from the Lannan Foundation, the Moroccan Wissam of intellectual merit handed to him by King Mohammad VI of Morocco, and the USSR’s Stalin Peace Prize. A Moroccan writer; born in 1950 in Qusaybah. She studied English in Rabat and then moved to the United States to study at the University of Texas in Austin, working in translation and authoring. She worked as a journalist, and has worked in several collections ministerial including the Office of the Prime Minister. Her first book called “Year of the Elephant” was published in 1980, named after a battle in Islamic history. In the book, during an early religious battle, a flock of birds came and dropped stones on the enemy elephants, causing them to turn around. Leila establishes a comparison between this historic battle and the Moroccan’s battling for independence from France. In her eyes Moroccan independence fighters were mere birds compared to the gigantic global power of the French. Elias Khoury is a Lebanese novelist, playwright, critic and a prominent public intell ectual. Khoury has published ten novels as well as several works of literary criticism, all of which have been translated into several languages. He has also written three plays. Khoury’s novels are notable for their complex approach to political themes and fundamental questions of human behavior. His narrative technique often involves an interior monologue, at times approaching a stream of consciousness. His most recognized works include, “The Little Mountain”, “The Journey of Little Gandhi” and “Gate of the Sun”, addressing the ideas of memory, truth and storytelling. “Gate of the Sun” was made into a film by Egyptian director Yousry Nasrallah. Regarded as one of the first contemporary writers of Arabic literature to explore themes of existentialism. Naguib Mahfouz published 34 novels, over 350 short stories, dozens of movie scripts, and five plays over a 70-year career, achieving worldwide recognition, winning the Nobel Prize of Literature in 1988. Many of his works have been made into Egyptian and foreign films. Mahfouz’s prose is characterized by the blunt expression of his ideas. His written works covered a broad range of topics, including socialism, homosexuality, and God (all of these subjects being forbidden in Egypt at the time). Naguib Mahfouz’s central work in the 1950s was “The Cairo Trilogy”, which he completed before the July Revolution. The novels were titled with the street names “Palace Walk”, “Palace of Desire”, and “Sugar Street”. A good way to be introduced into Mahfouz’s works are popular titles; “Tharthara Fawq Al-Nīl” (translated as “Adrift on the Nile”) and “Children of Gebelawi”, a story that portrays the patriarch Gebelaawi and his children, average Egyptians living the lives of Cain and Abel, Moses, Jesus, and Mohammed. Ghassan Kanafani was a Palestinian writer and a leading member of the Popular Front for the Liberation of Palestine. On July 8, 1972 he was assassinated by a car bomb in Beirut. Kanafani published his first novel, “Men in the Sun” in Beirut in 1962. He also wrote a number of scholarly works on literature and politics. His thesis, “Race and Religion in Zionist Literature”, formed the basis for his 1967 study on Zionist literature. Gibran Khalil Gibran was a Lebanese-American artist, poet, and writer of the New York Pen League. In the Arab world, Gibran is regarded as a literary and political rebel. His romantic style was at the heart of a renaissance in modern Arabic literature, especially prose poetry, breaking away from the classical school. In Lebanon, he is still celebrated as a literary hero. He is chiefly known in the English-speaking world for his 1923 book “The Prophet”, an early example of inspirational fiction including a series of philosophical essays written in poetic English prose. The book sold well despite a cool critical reception, gaining popularity in the 1930s and again especially in the 1960s counterculture. Born in 1948 in the Fezzan Region, Ibrahim Al-Koni was brought up on the tradition of the Tuareg, popularly known as the veiled men or the blue men. Mythological elements, spiritual quest and existential questions mingle in the writings of Al-Koni who has been hailed as magical realist, Sufi fabulist and poetic novelist. Al-Koni has published more than 80 books and received numerous awards. All written in Arabic, his books have been translated into 35 languages. In his world renowned novel “Gold Dust”, Ukhayyad and his thoroughbred camel flee across the desolate Tuareg deserts of the Sahara after being rejected by his tribe and hunted by the kin of a man he killed.